100sareepact | Miss You Mom, Always…..
71/100 #100sareepact is a trial to recreate some past memories through my today’s saree -tale. As I grew up I had an uncanny affinity towards this particular piece, but I never had that access. With my surprise when my Mom left us for a better world, my father did not allow me to wear her favorite sarees. 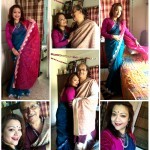 I found two photographs of Mom, wearing this saree; in fact in one of them where she is posing with my father, she was also wearing a white woollen cardigan. I am crazy, and by now you guys also know me. To recreate that moment in my way and emote the essence of that photograph, I wore a white woollen wrap to look like my mother. The posture, the look, and the bindi, I tried imitating her all-out! 71/100 is an all-time favourite, orangish brown-floral/jungle print crepe which I paired with a rust coloured designer blouse. This is my Mom’s saree and I believe, somehow I felt connected with her femininity through this. She used to drape her sarees wonderfully; few of those images came back like a flash of light! 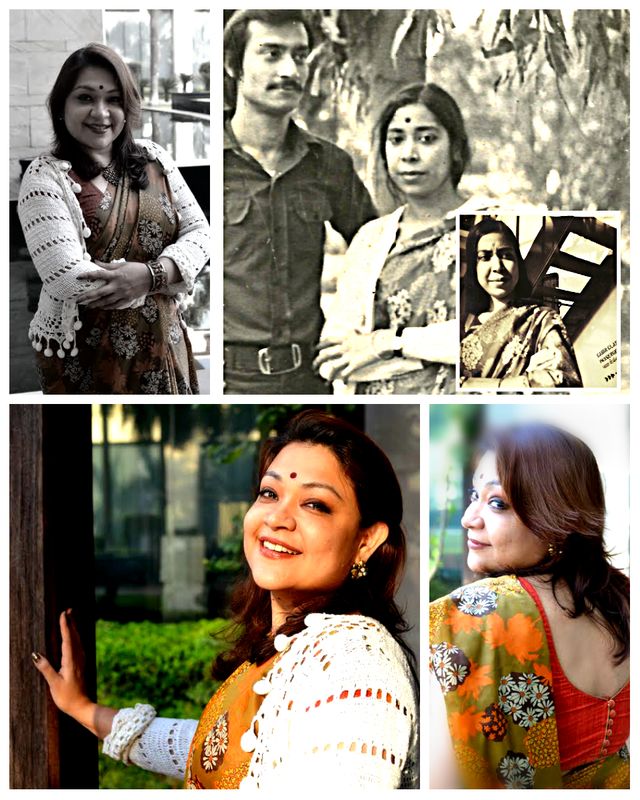 Thanks to Poo who was more than happy to take few candid shots in the office and recreate these magical moments connecting my Mom…..
Mamon, trust me you are missed always, even after 19 years…. It’s just that in this pace of life I forget to stop, look above the sky and wish you a goodnight every day. In reality, as you already know you are there inside me and I am part of you till my last breadth.